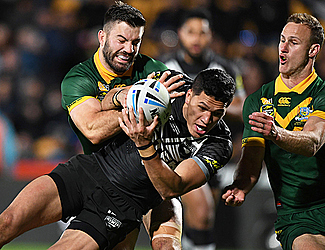 "The boys did an amazing job," Kiwis first-time captain Dallin Watene-Zelezniak said. "They took it up for the crowd and our country and did our families proud. "But we're still building. It's only a start. We've got a foundation now." Australia entered Saturday's match as an overwhelming favorite, so much so that in the first between the teams in New Zealand in more than four years, Mt. Smart Stadium was less than half full. New Zealand was on a three-match losing streak in tests against all countries, and discouraged fans stayed away. Valentine Holmes and Lattrell Mitchell were a dangerous attacking combination down the left-hand side and they created Australia's first try, to Holmes, after only two minutes. They remained a threat throughout the match but wanted for opportunities. Australia's late rally put the Kiwis under pressure but the were able to see off the threat. "It was always going to be tough playing the Kiwis at home," Australia captain Boyd Cordner said. "We didn't give ourselves much chance but we stuck to it and it was a tight finish. Our ball control was pretty disappointing."